EVD 12E is an innovative web-based solution that offers simplified options to receive payments for services provided by you. 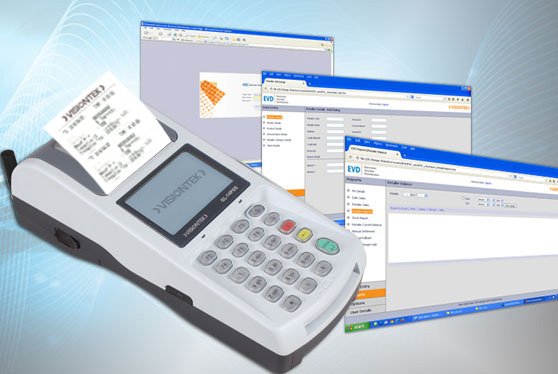 Just install the VISIONTEK EVD software at the server, and manage the selling of mobile top up and recharge to different wireless handheld POS terminals installed at various retailer locations! The VISIONTEK EVD 12E application software, with its multiple options, improves Operator efficiency, generates additional revenue, and provides well-organized services to the subscriber. Caters to Mobile & Utility bill payments, prepaid water, Municipal tax collections, Agency banking, Lottery, Vehicle tax, Road tax collections, Traffic violation tickets payments.